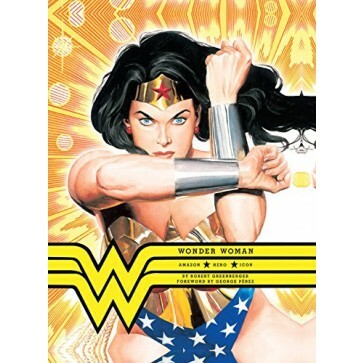 The book contains more than 250 Wonder Woman illustrations, including covers, interior comic art, and sketch treatments, beginning with her inception in the early 1940s to present-day treatments of the character. Loosely chronological, Wonder Woman explores idiosyncratic creator William Moulton Marston's interest in ideas of a "new woman" for the twentieth century; costume and character story changes over the decades; the influence on all other female comic book characters since her inception; and how Wonder Woman is still powerful and relevant in today's comic book renaissance. The book contains more than 250 Wonder Woman illustrations, including covers, interior comic art, and sketch treatments, beginning with her inception in the early 1940s to present-day treatments of the character. Celebrated artists include Alex Ross, Jim Lee, George Perez, and Brian Bolland, to name only a few. The book will also feature rare covers and pin-up posters created for past special-edition comic books. Wonder Woman is certain to appeal to fanboys and fangirls, collectors, and newcomers to the comic book genre alike.